Meanwhile, Reactive Streams started getting traction and an entire ecosystem of libraries discussed this transition. The regular concern ? Implementing Reactive Streams semantics is all but an easy task. We observed an increasing need for a reactive foundation to solve message-passing and implement common streaming operators. We therefore created a dedicated project space for Reactor Core and started a focused effort with Spring Framework team. - Anatoly Kadyshev who works on the amazingly efficient Aeron Reactive Streams bridge for Reactor IO. “RSC” is therefore a freeform project similar to the JCTools take on concurrent queues. One of its biggest progress is a form of “Fusion” protocol to reduce overhead of most synchronous and some asynchronous stages in a reactive processing chain. Finally, the effort helped fixing more than a hundred of streaming bugs and our testing process now involves RSC unit/integration testing and JMH benchmarks combined with Reactor own integration testing and benchmarks. Today’s Reactor blog series starts with a joyful event, Reactor Core 2.5.0.M1 release ! 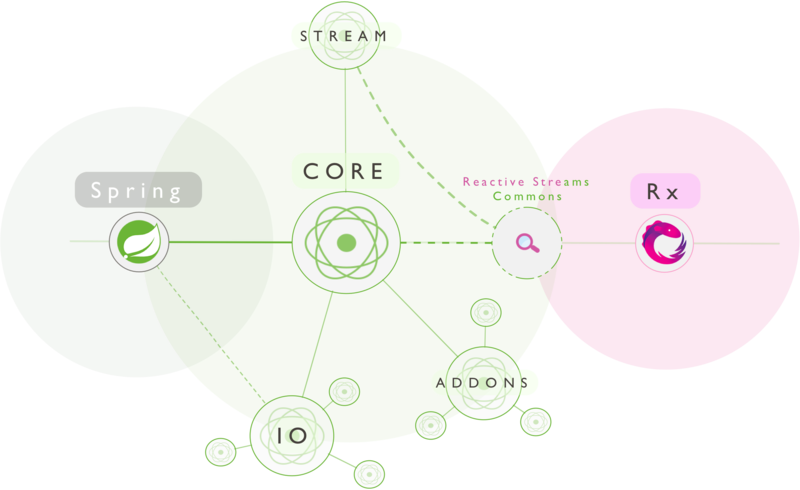 Under its new scope and close ties with Reactive Streams Commons, Reactor Core offers just enough Rx coverage to build reactive apps or libraries alike , e.g. Spring Reactive Web support. For the impatient reader, have a look at the already available quickstart on github. – Featuring SchedulerGroup, TopicProcessor and WorkQueueProcessor. – Superseed the former Enviroment/Dispatcher couple while answering the same needs and a simple migration path will shortly be documented. No more static state holding references of dispatchers.